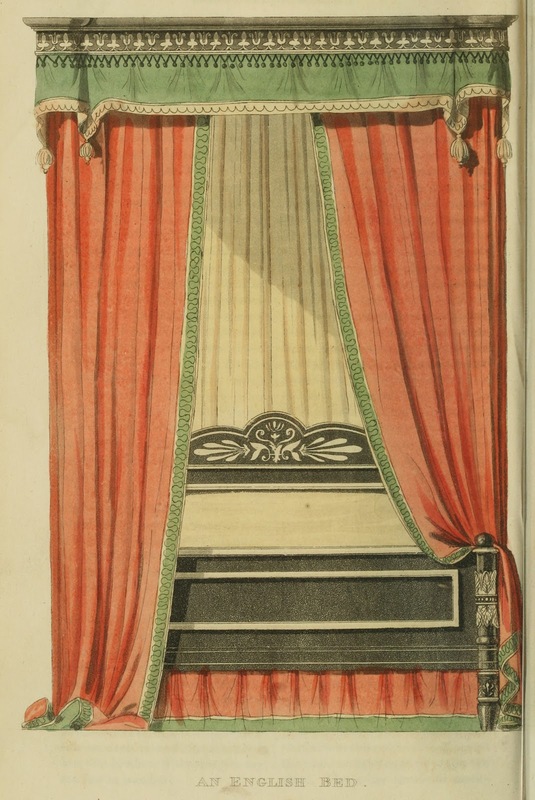 that were published in Ackermann's Repository in the early 1800's. 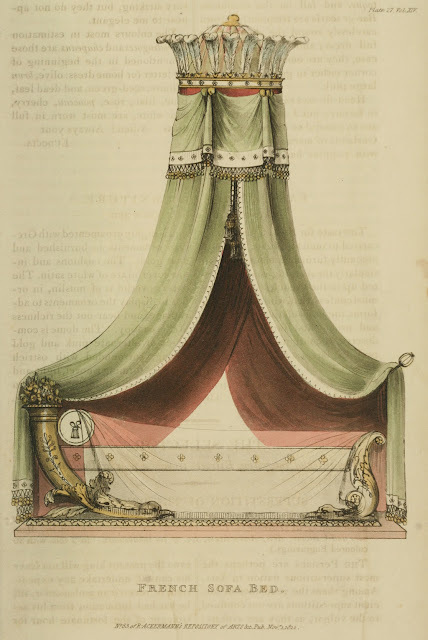 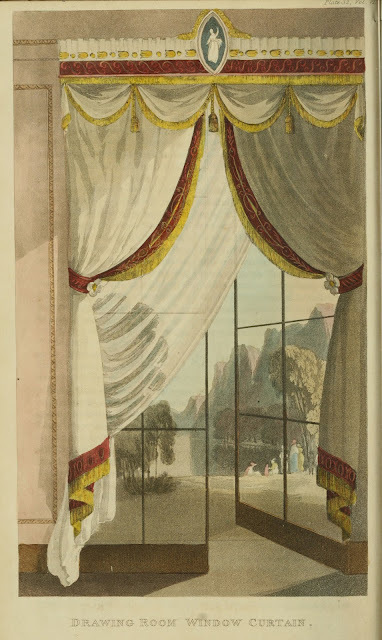 These plates from Ackermann's 2nd series were from 1816 to 1822.
which I posted about HERE on a separate "Regency Curtain Post". 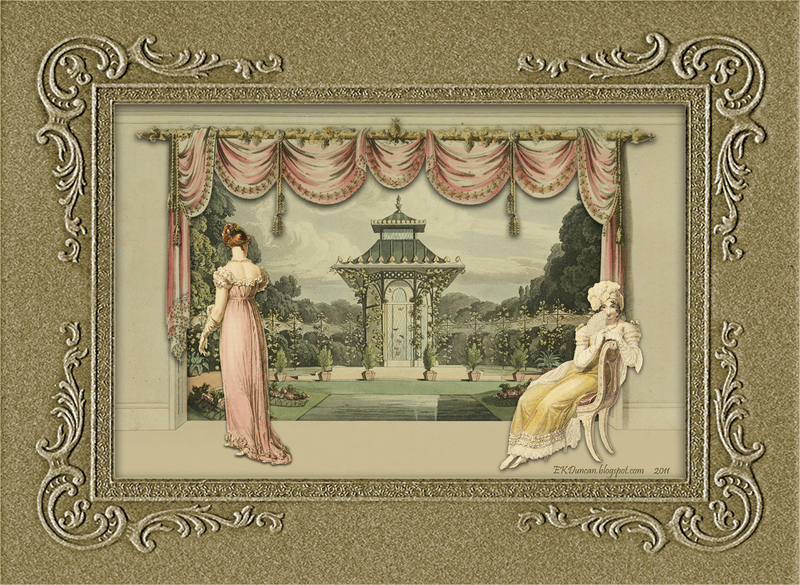 I hope you will take a look at that post too. 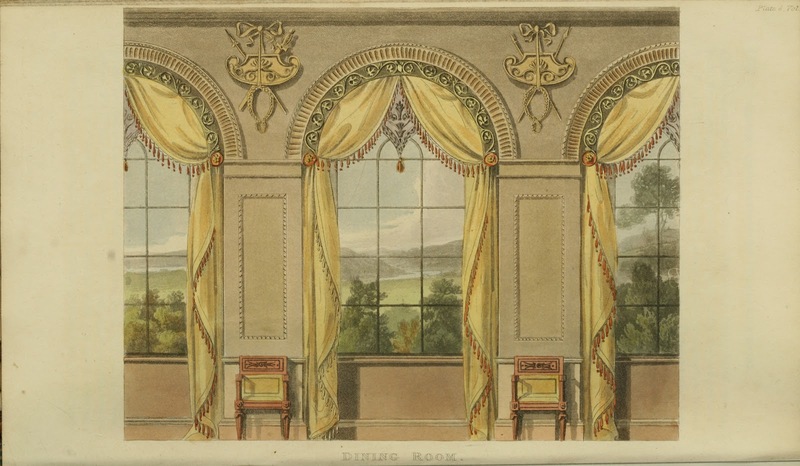 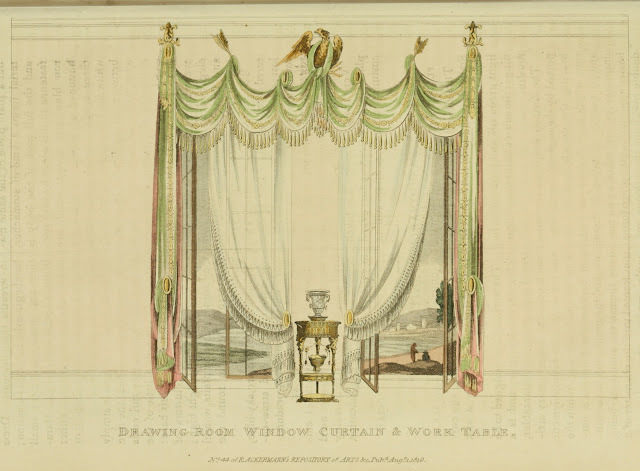 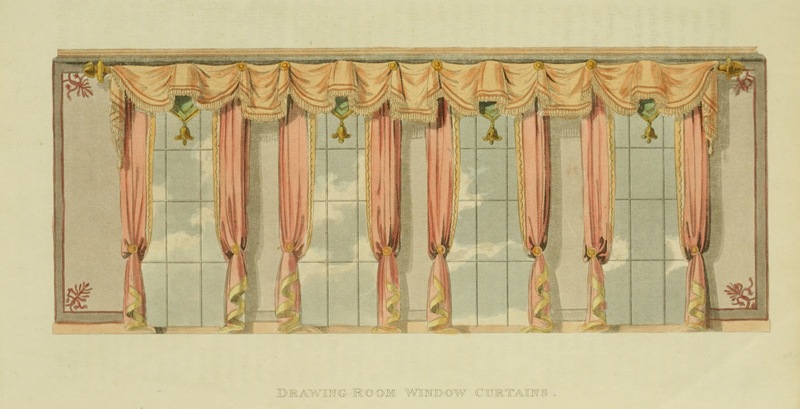 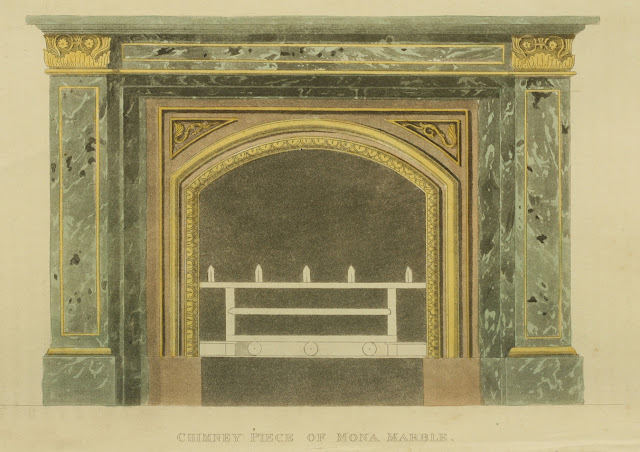 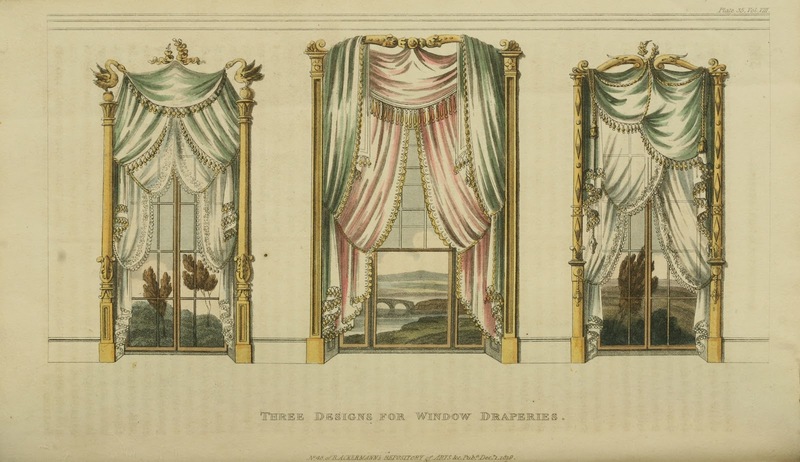 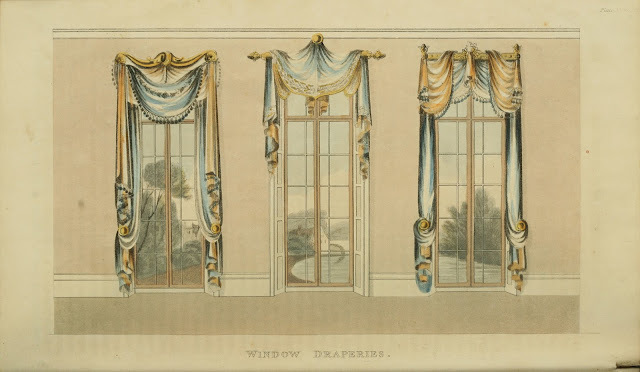 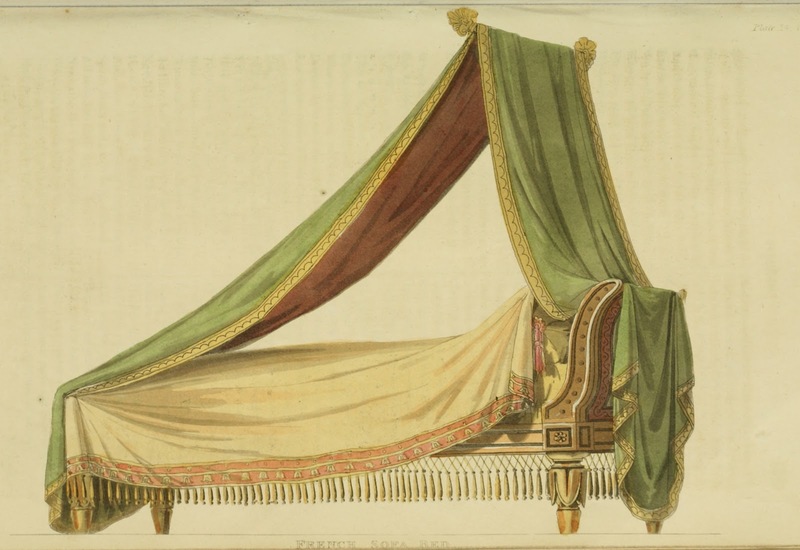 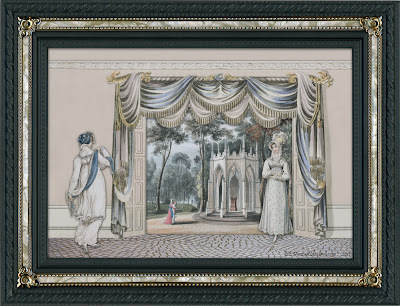 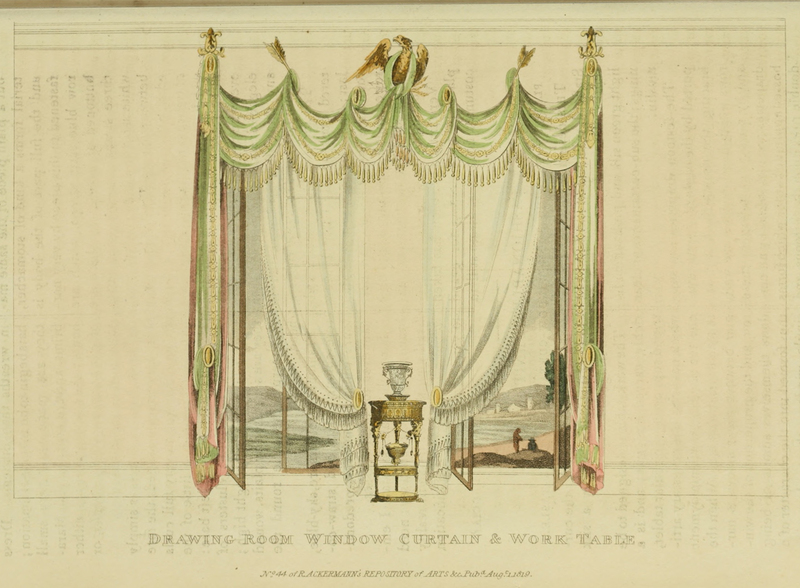 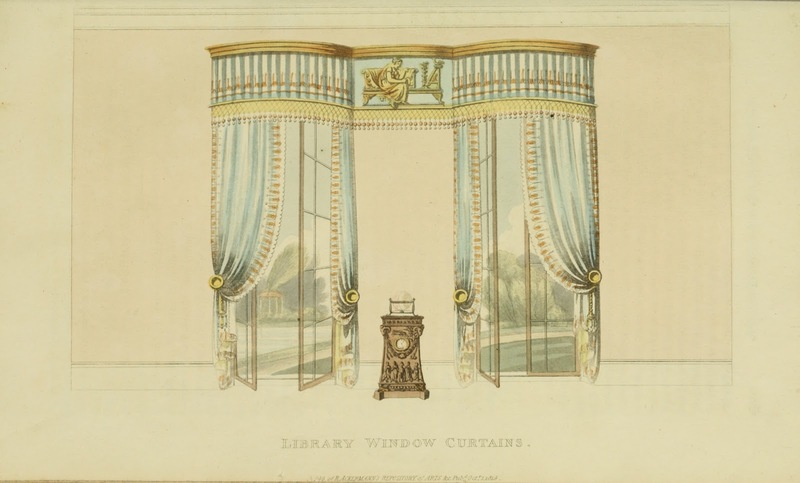 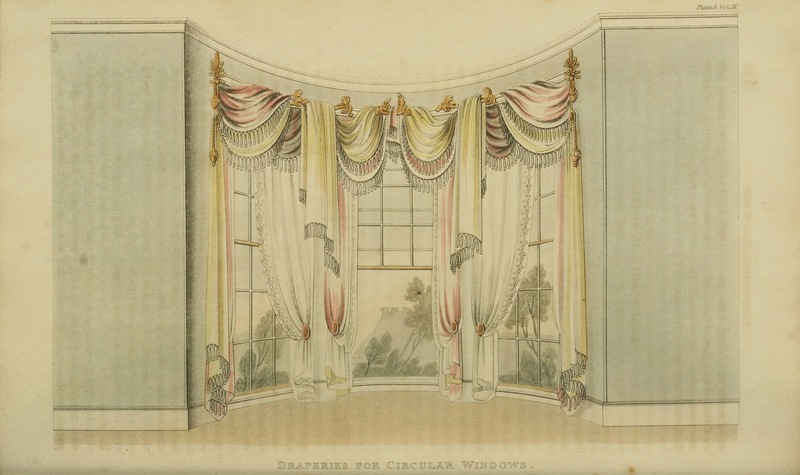 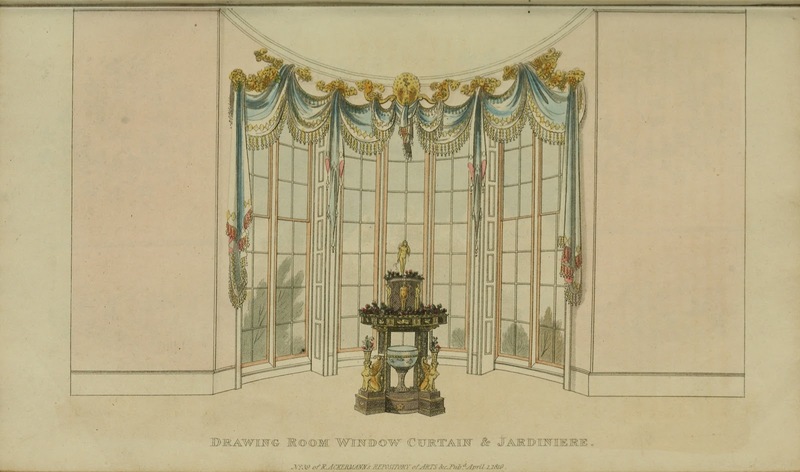 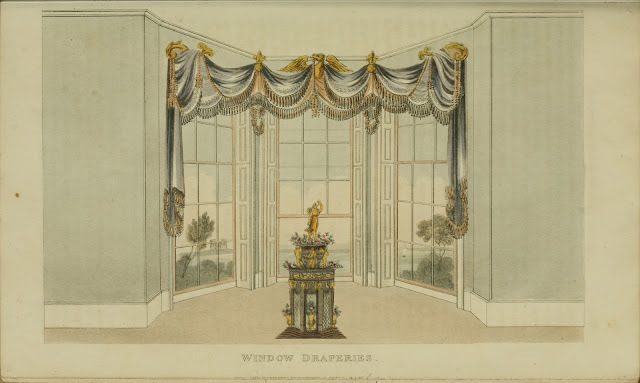 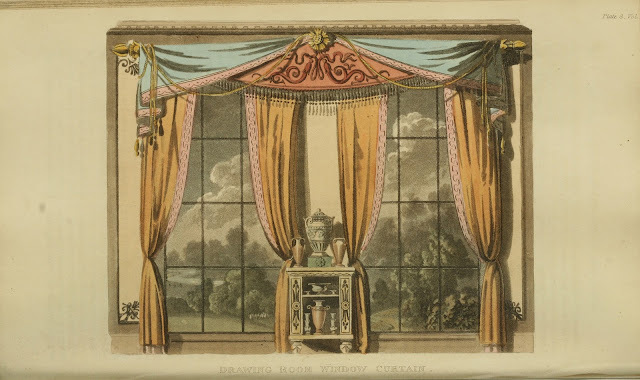 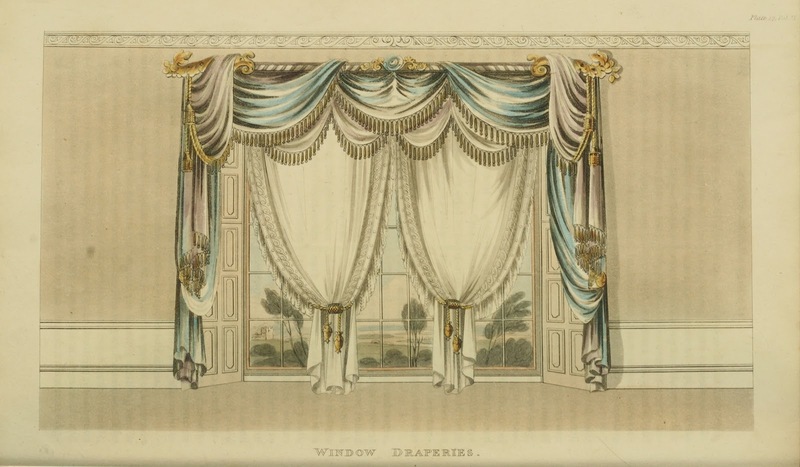 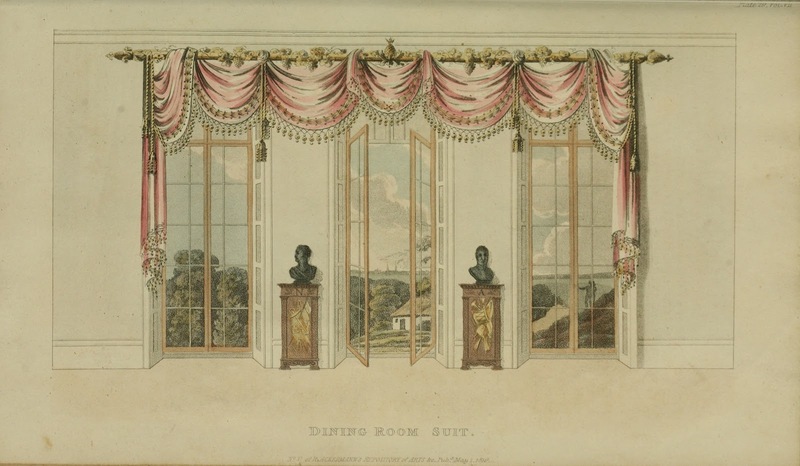 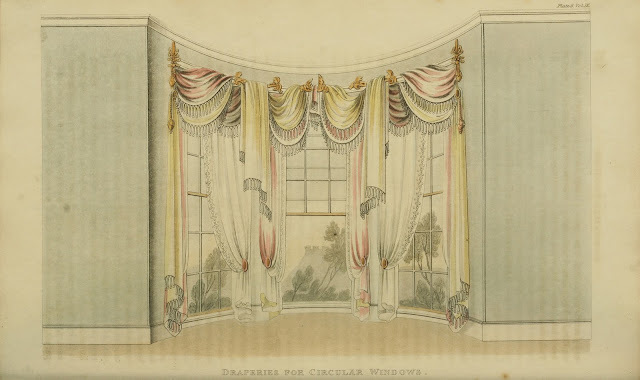 Curtains and draped fabric played a strong role in the furniture plates for 1816 as evident in all the images except for the two depicting fireplace surrounds. Obviously you would not have wanted curtains or any draped fabrics close to an open flame so these two are the only plates not showing yards of beautiful flowing fabric. 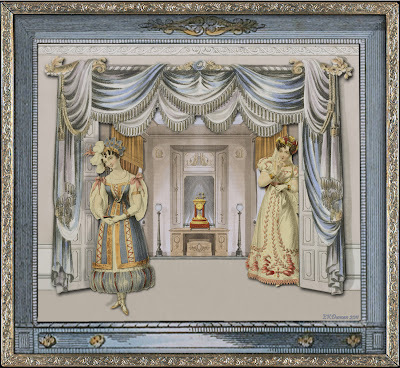 I took the above image and created variations of a full room with it. I created this digital art piece "Waiting for Midnight" using that full room in the background. 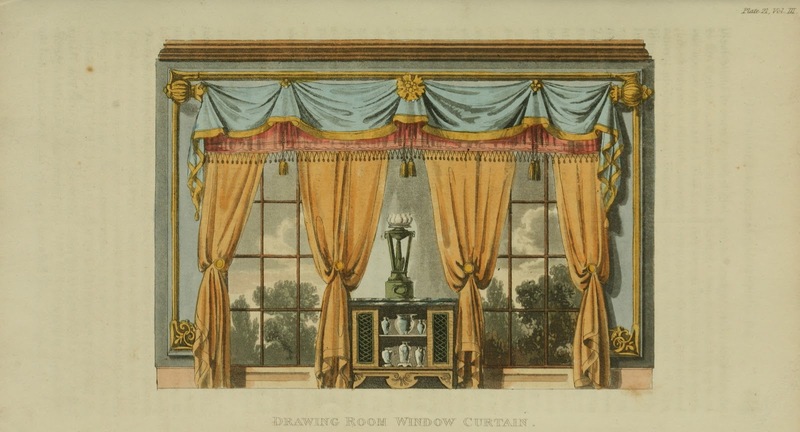 The curtain is from 1820 and can be seen further down in this post. 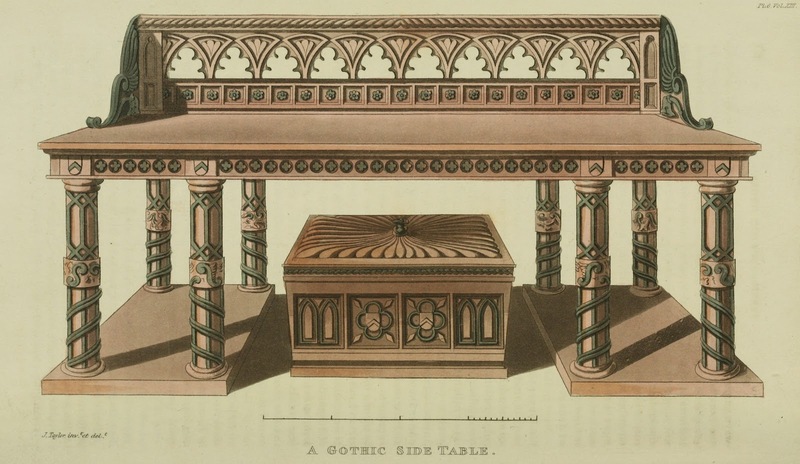 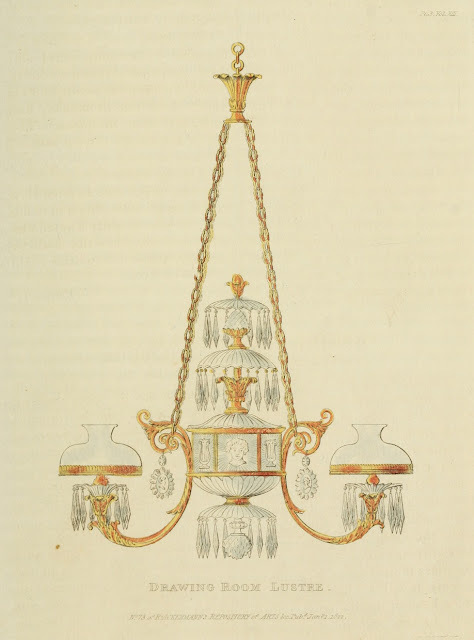 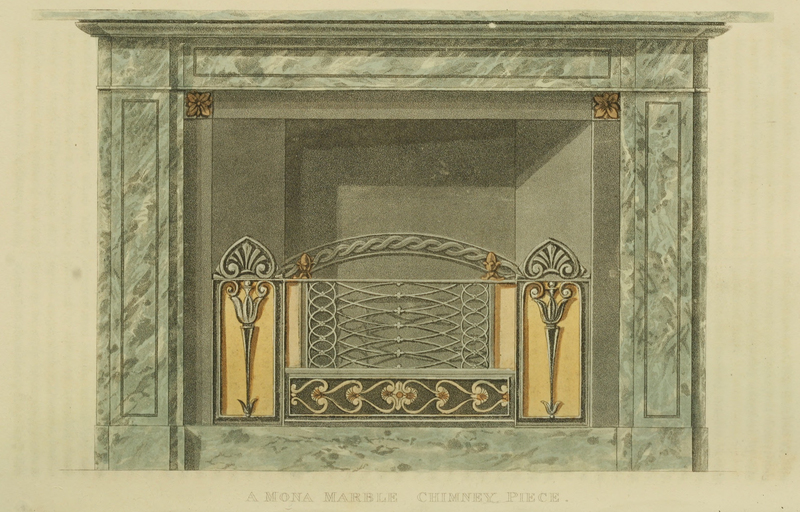 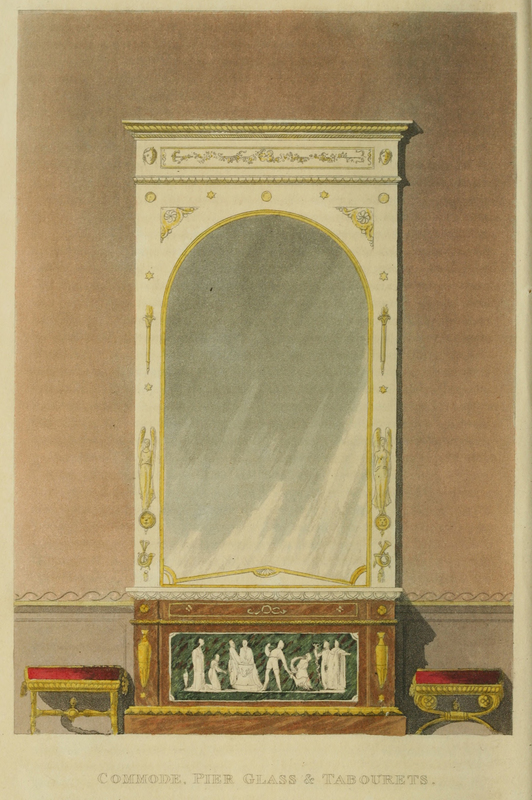 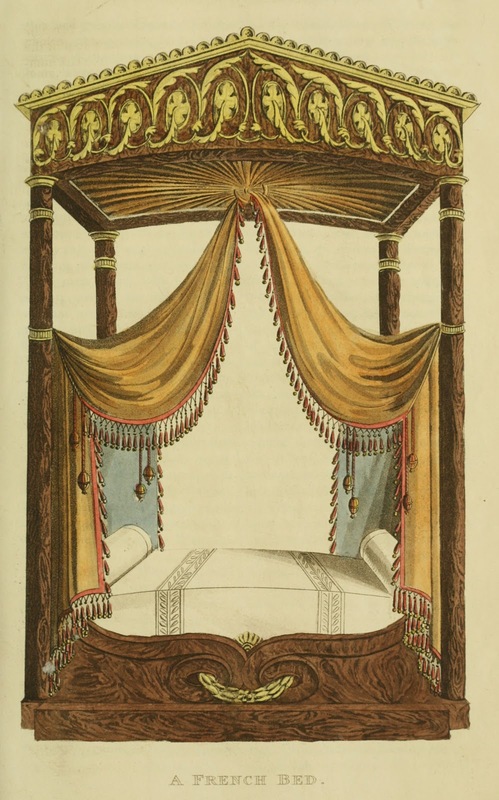 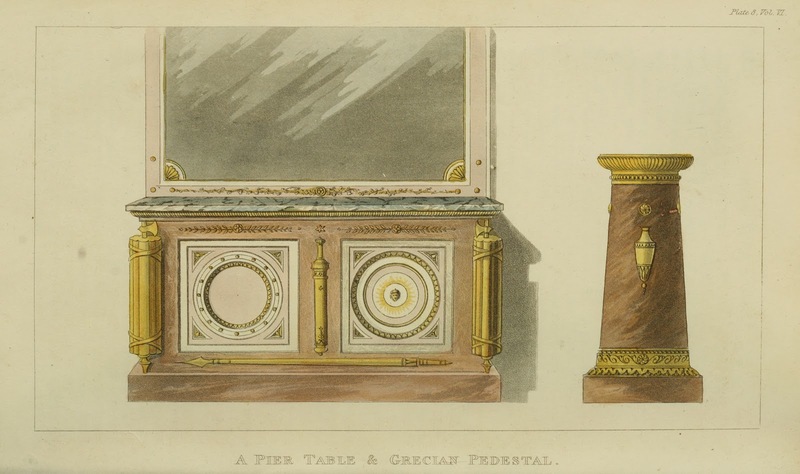 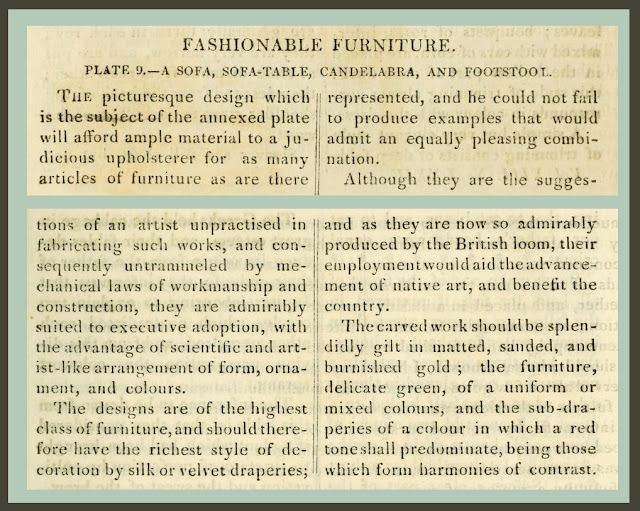 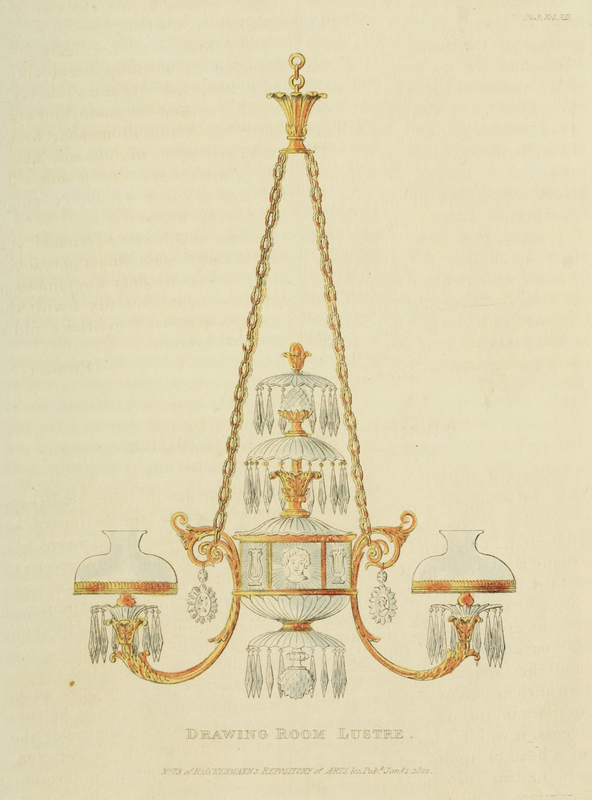 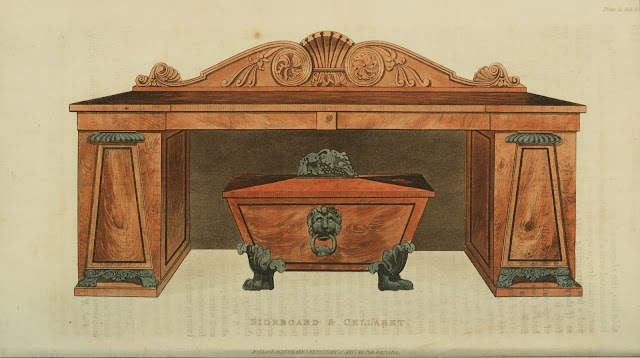 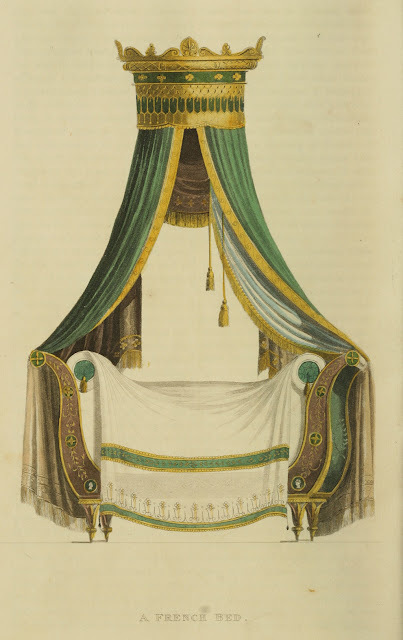 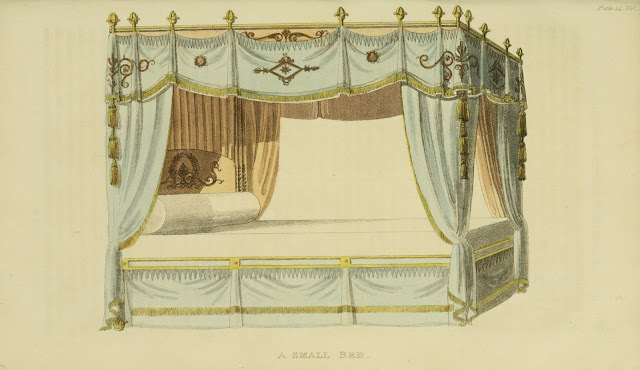 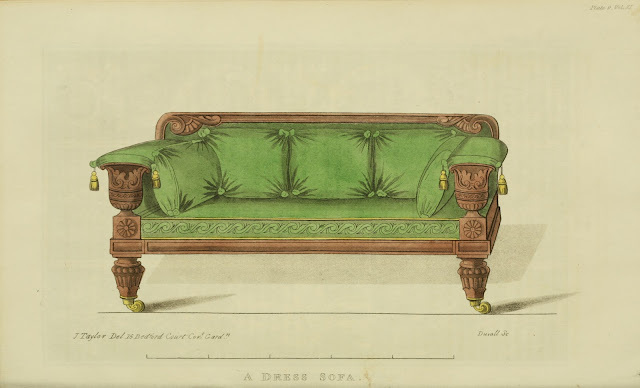 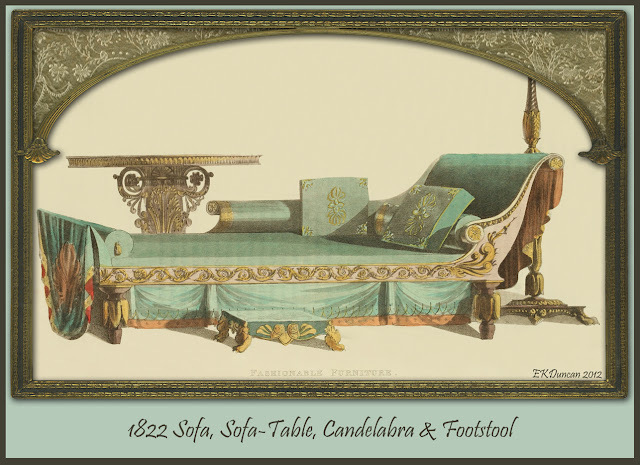 Usually there was at least one furniture plate shown in every monthly issue of Ackermann's Repository; however in 1817 there were only about half as many. 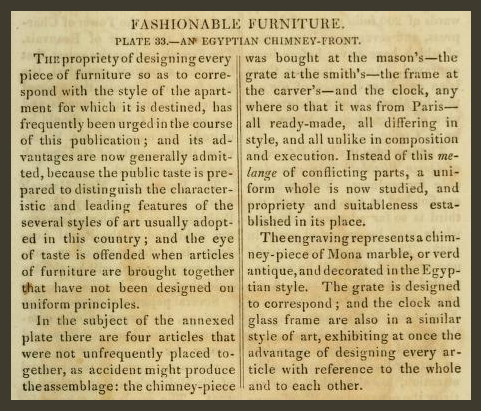 I believe this may be due to an ongoing series that began in 1816 and continued throughout 1817 called Architectural Hints. Once this series concluded in 1817 these items were published and sold in their own separate book in 1818 titled "Rural Residences Consisting of a Series of Designs for Cottages, Small Villas and Other Ornamental Buildings". 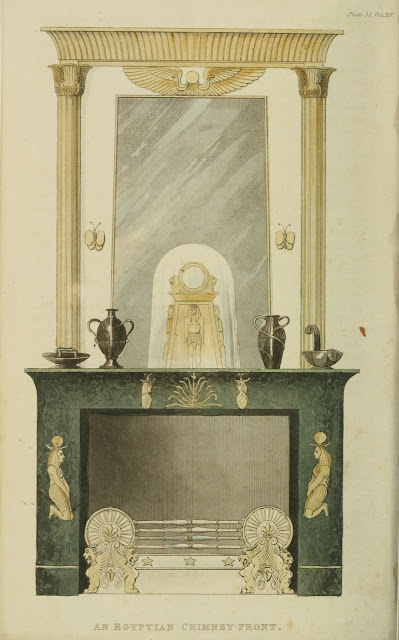 So it is reasonable to think there was a rush to get that series in Ackermann's completed, allowing for fewer Furniture plates to be shown - but that is just a guess on my part. 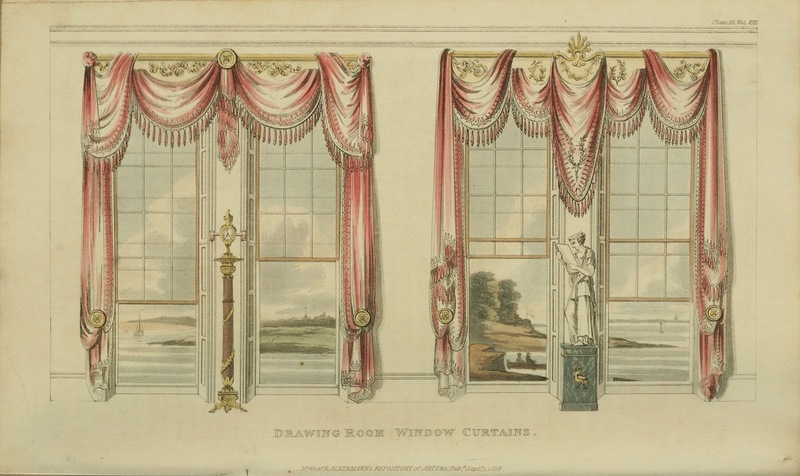 Ive shown those images on a different post and they can be seen by clicking HERE for those interested. 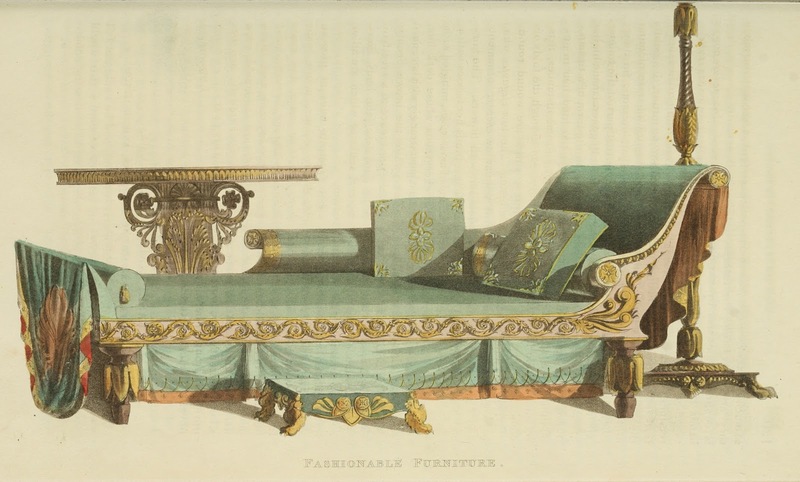 Though there were only the 5 furniture plats published in 1817, they are lovely examples of home fashions. And there is a little bit for every room in the house. 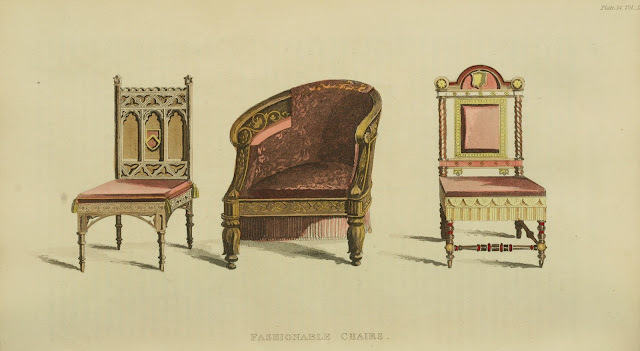 and those all appeared in the last half of the year. 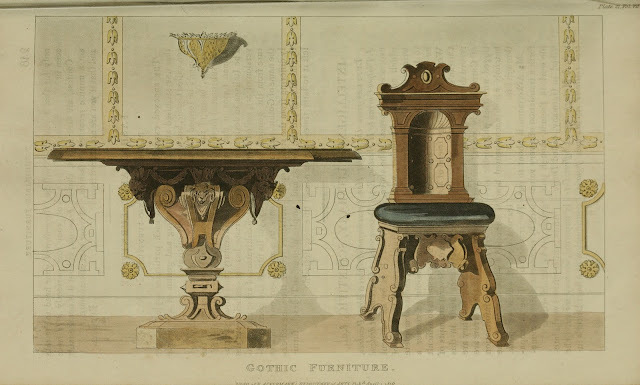 Here again I'm not sure why the lack of furniture plates in this year. 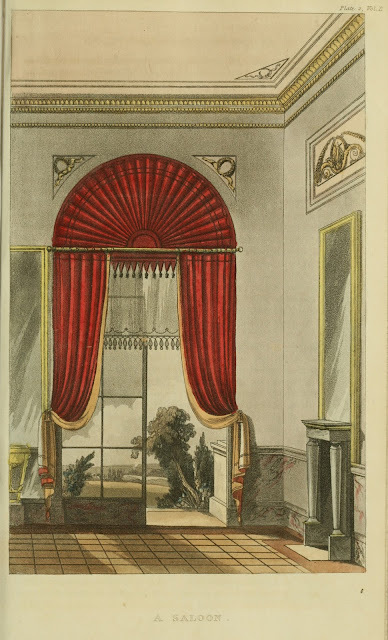 It may be that the publisher did not think they had much popularity with the public or it could be as simple as another series taking precedent. There was a unique series in 1818 showing a full set of playing cards; there were a total of 12 plates showing 4 playing cards each with the final plate in the January 1819 issue for a total of a 52 card deck. 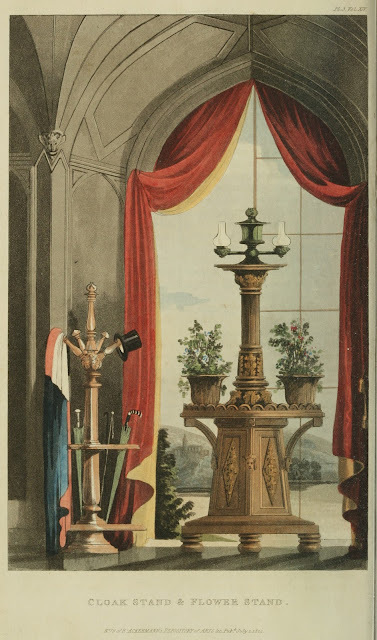 My first Ackermann's Post was about that card series and can be seen HERE. 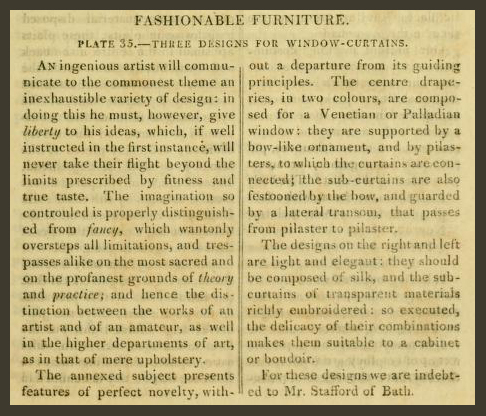 and seem to work well with one and other. 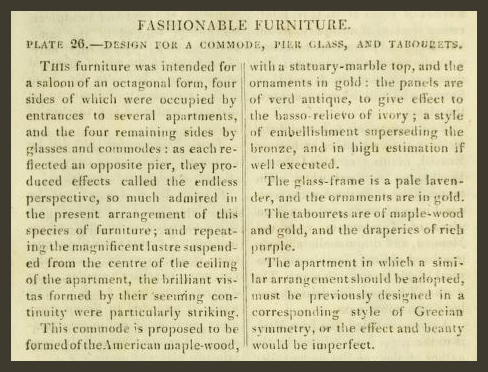 so I for one am happy to see so many of them in 1819 and then again in 1820. 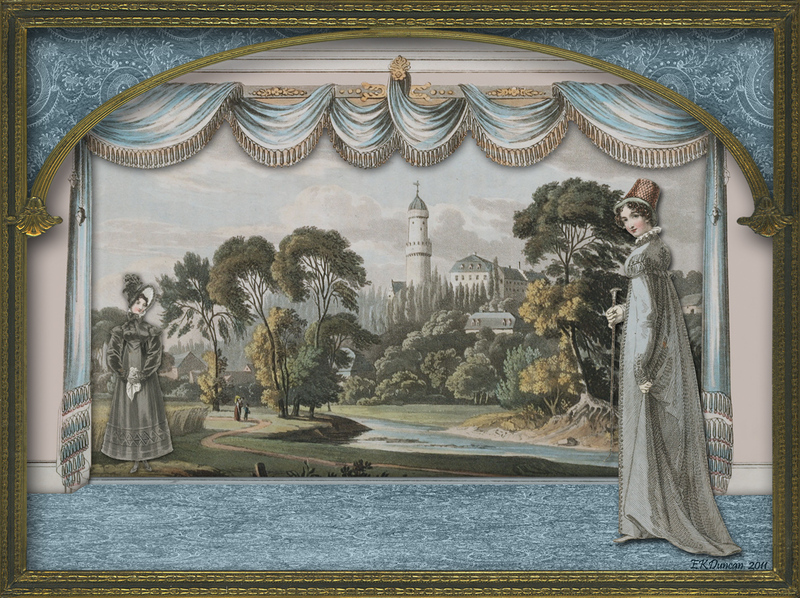 I altered this swagged curtain into a png image so that I could use it in various art projects. 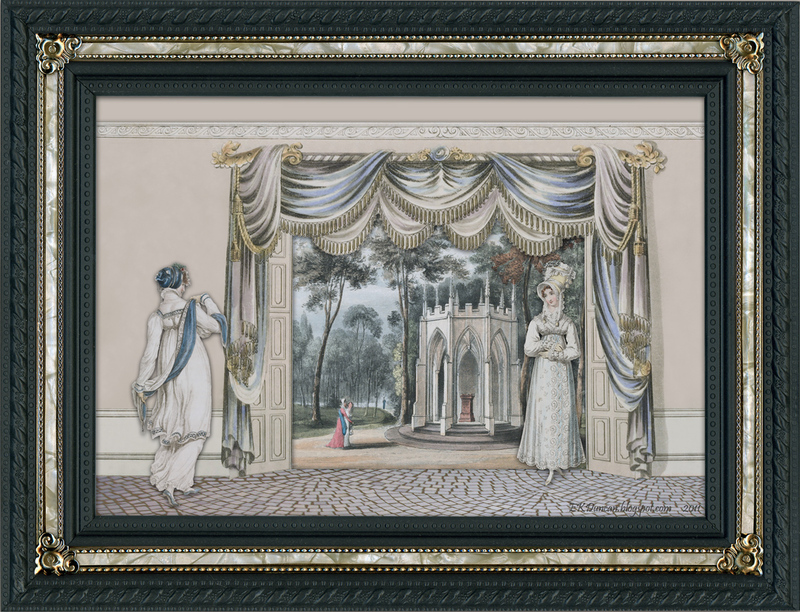 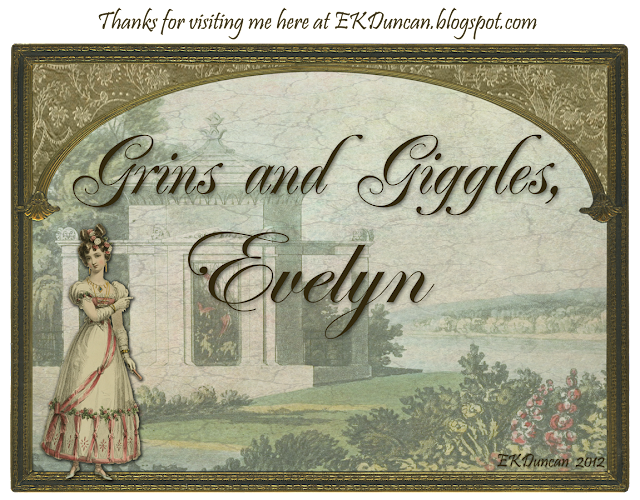 My post for "Regency Ladies with a Curtain View"
I think these are so fun to read and hope you do too. 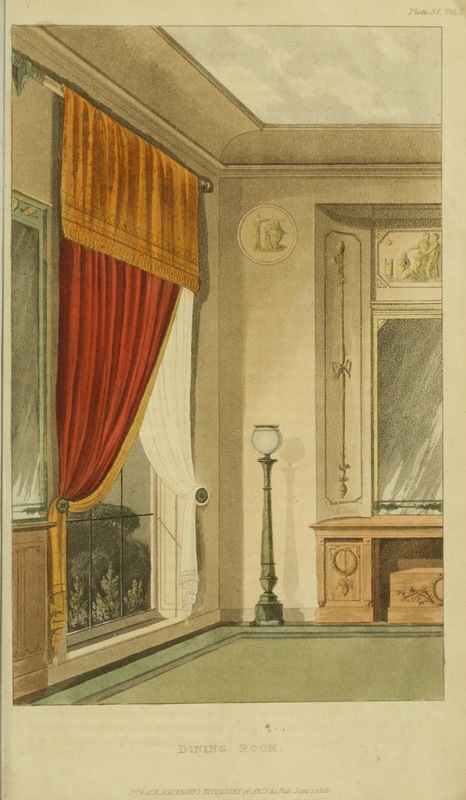 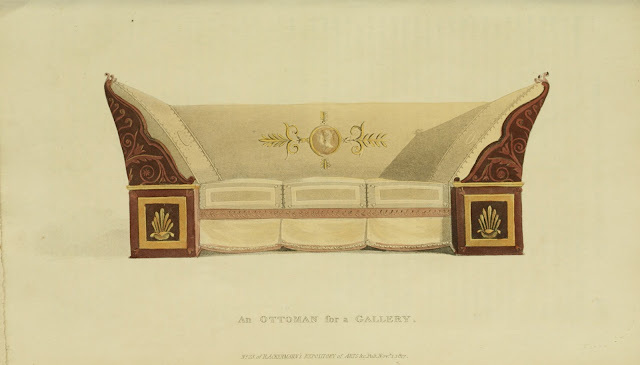 Only 5 furniture plates appeared in the 1821 issues of Ackermann's and no curtains at all. 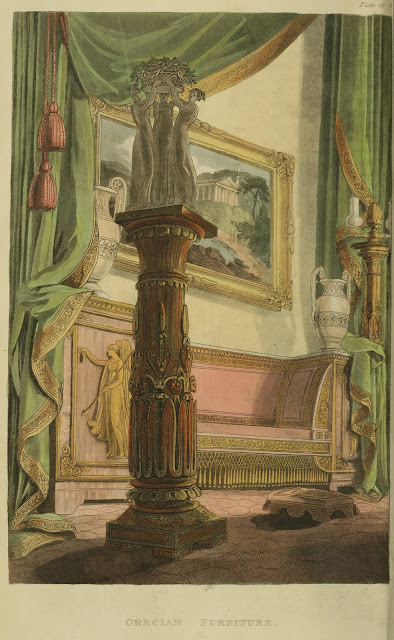 This time we get to see a Regency Dress Sofa, Marble Chimney Piece, Gothic Furniture, Tables and a beautiful accent piece. is an imitation of one represented on a tomb in Luton church;..."
often composed of several lights and often used in pairs. 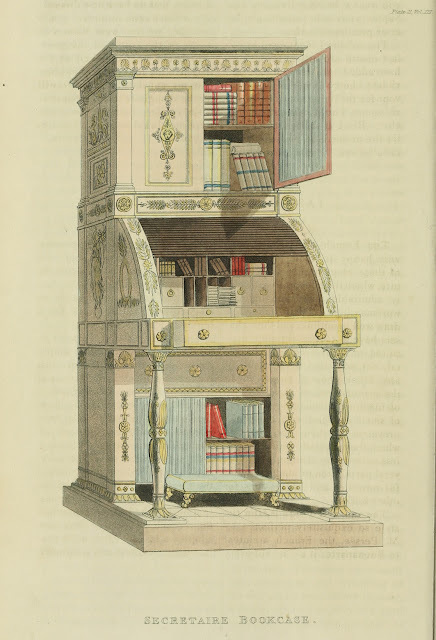 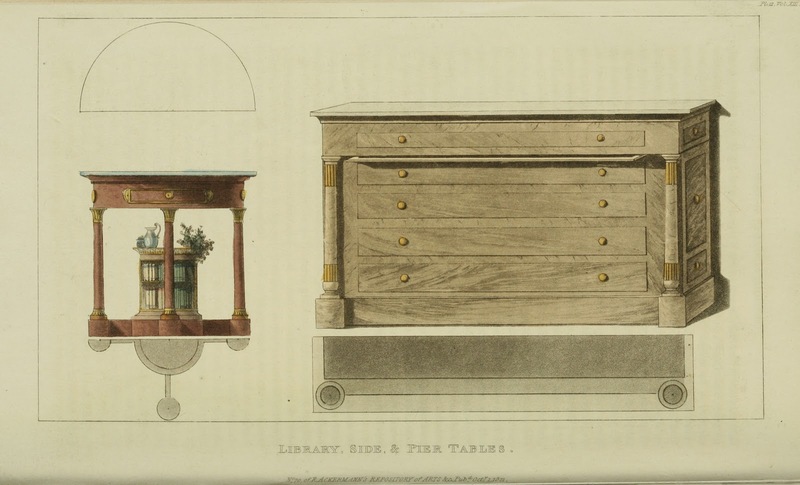 Ackermann's Repository closes out it's 2nd series in 1822 with some interesting furnishings. 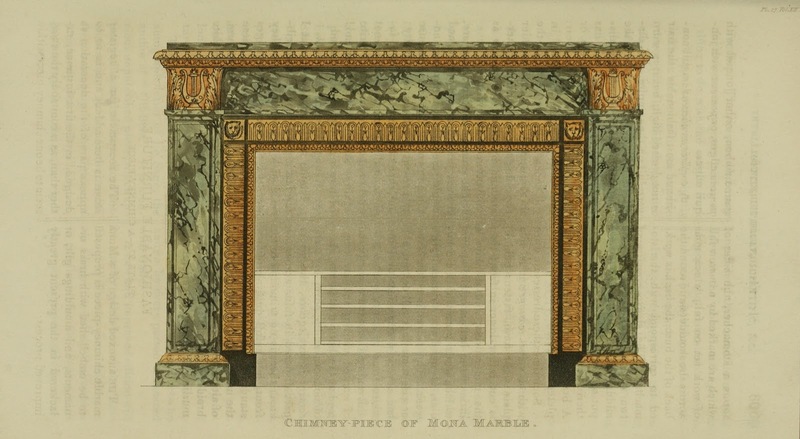 and even an Egyptian look for a fireplace. 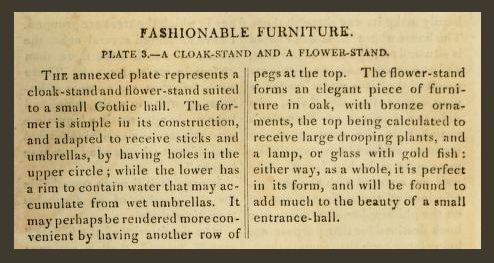 Personally I found these items most intriguing. I really got a kick out of the description for Furniture plate 3. 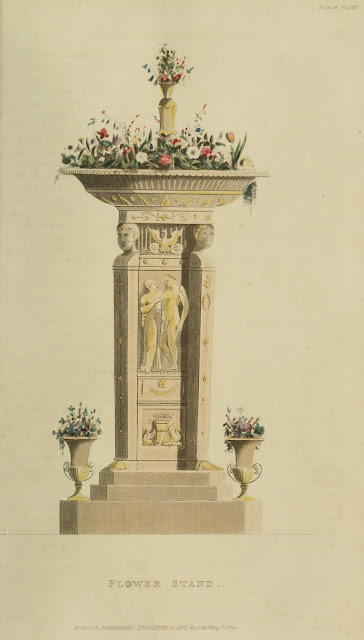 There really was a bit of whimsy in objects like this plant stand. 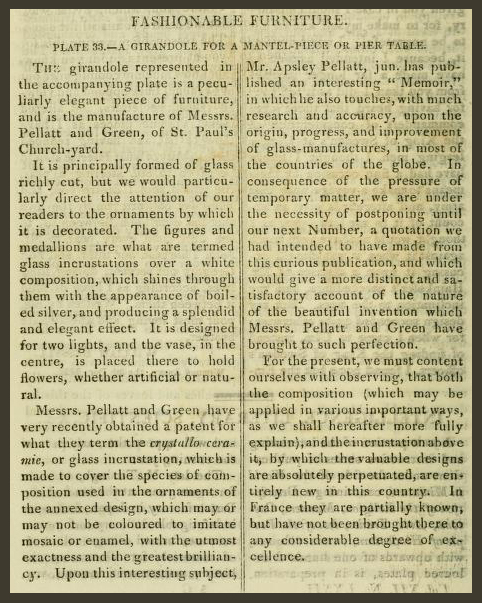 Just image it containing goldfish in a globe up top - what fun! This is the Ackermann's description for the Coat Stand and Flower Stand above. 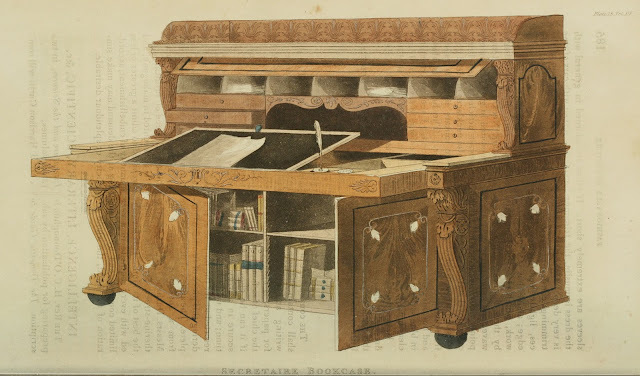 here is a case where it is shown to be fashionable again. 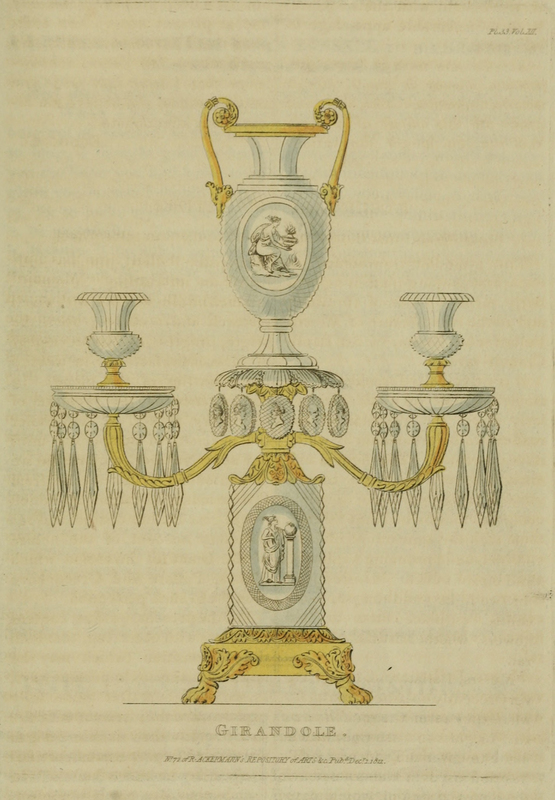 Ackermann's Repository furniture plates for the Regency period. the last and final segment in this series. 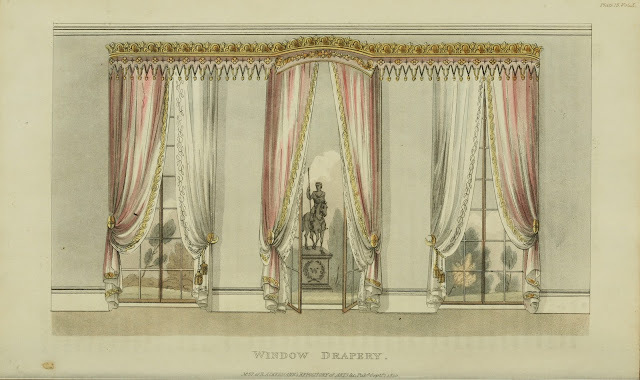 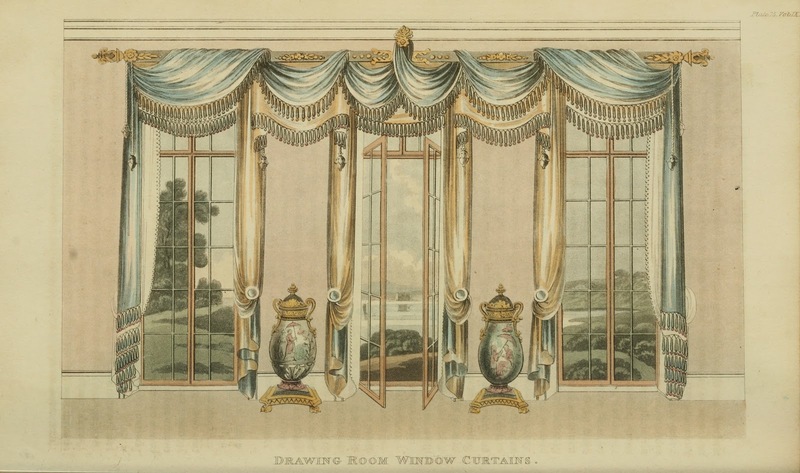 I love the plates concerning the Drawing Room Curtain, it's so delicate drawing! The curtains are some of my favorite images also. 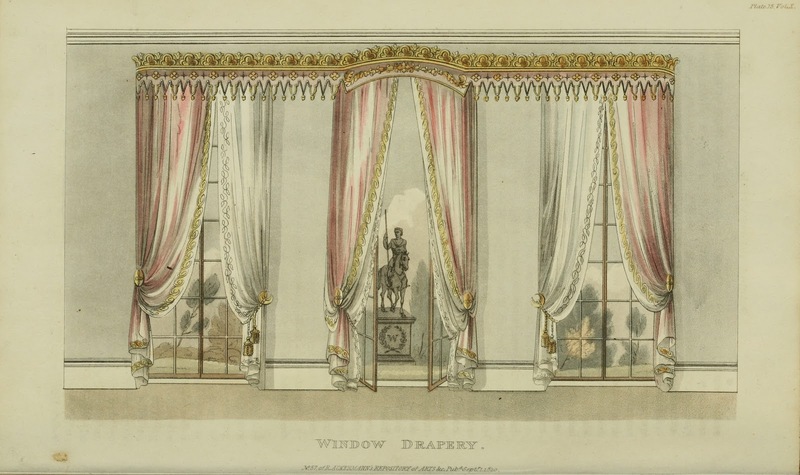 on those huge windows, overlooking a pretty garden. 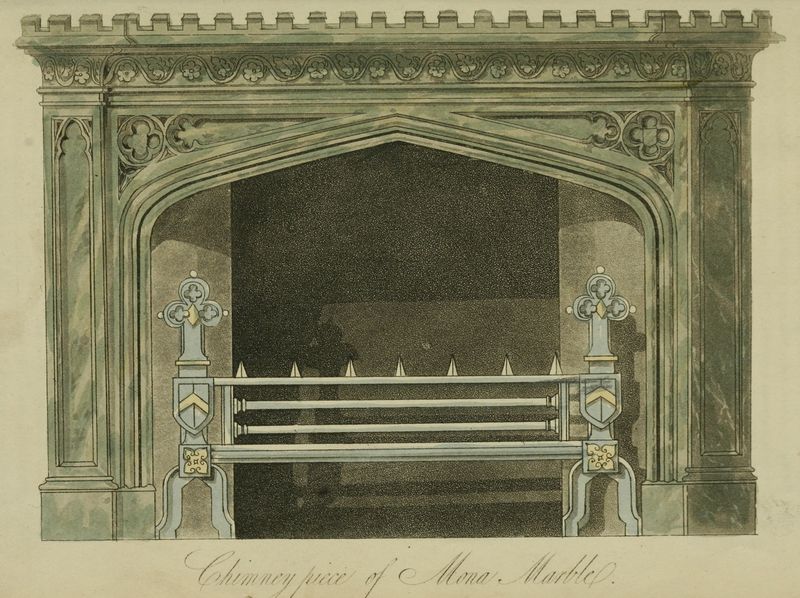 It must have been something to see, back in the day.